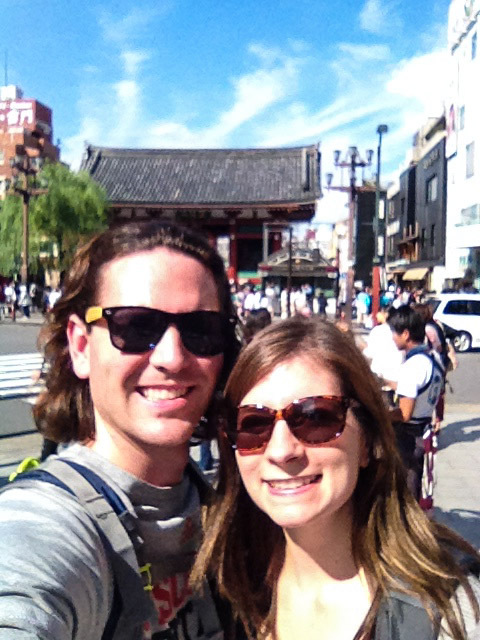 We made it to our first destination on our round-the-world (RTW) adventure – TOKYO, JAPAN! 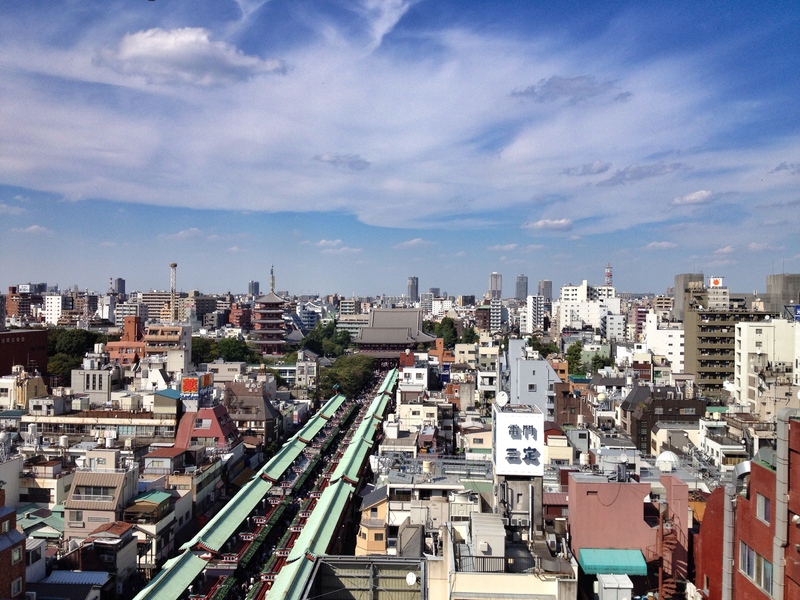 The view from the top of the Asakusa Culture Tourist Info Center. Overall, everything went as planned to begin our trip, which does not happen often when it comes to us and flying. We stayed in Minneapolis the night before with some friends and got to the airport without rushing in the morning. Our flight to Los Angeles was on time and smooth, which gave us a couple hours to kill before we hopped our flight to Tokyo. 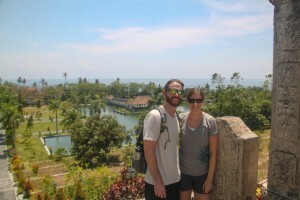 We filled our waters, grabbed a quick snack and prepared for the long haul over the Pacific. Los Angeles to Tokyo is an 11 to 12 hour flight and it sure felt like that much and more. We went for the Economy Comfort seats on our Delta 767, which afforded us a few extra inches of legroom and more recline. Unfortunately, this still was not enough to make a 12 hour plane ride enjoyable. We had a couple glasses of wine and dinner and watched a movie before trying to sleep. Needless to say, we did not get much sleep during the flight. We estimate that each of us may have a gotten a total of an hour sleep off and on, which was not great for my plan of staying awake and hanging out at the airport until the next day. Our bodies were sore and we definitely had some swollen feet. Upon arrival, we got through customs, picked up our bags and claimed a few benches in the international arrival area. We arrived late on Saturday (basically Sunday AM), so I figured getting a hotel was a waste as we would have to check out by 10am anyway. So, why not stay at the airport and maybe sleep if we get tired? We each grabbed another hour of sleep and then paid $10 for the shower rooms and coffee sometime around 6am local time. Our first selfie! We’re standing in front of the entrance to Senso-ji Temple. After showering, eating some breakfast and getting our belongings together, we headed for the Tokyo subway. We made our way to the Asakusa area of Tokyo, where we will be staying for a few nights. We dropped our bags at the hotel and finally headed out to explore the city! So far, Tokyo has lived up to our expectations in terms of the culture, customs and food and we can not wait to get out and see more! Anyone have any recommendations on places we MUST visit over the next few days? Your photos are intriguing. Looking forward to more! Thanks, Mom! More posted today! God bless! We’ll be following you! God watch over you both! We’ll be following you! Sounds very exciting. Stay safe, healthy and enjoy the ride! Thanks Loma! We will definitely be safe and do our best to enjoy our time on the road.